For one handed lifting of empty Smooth Necked (not threads) glass carboys. Fits 3, 5, 6, 6.5 gallon smooth neck carboys. Easier to move a wet carboy with this handle when washing, sanitizing or filling. Carboys getting heavy, rigging pulley to lift them. All but one carboy has one and they give peace of mind when moving glass carboys. have one on my other carboy, and it makes things so much better! Definitely makes carrying and holding various carboys so much easier! A must have! I've given up trying to wrangle carboys without one of these. They are a pain to put on, or take off, but I do so once and for all, and never think about it again. Why live without this helper? Easy to attach/use. Wouldn't handle a glass carboy without one attached. This is an essential item - makes the movement of carboys so much safer - particularly when wet. I used an chest freezer to control fermentation temperature. These are a must have. They make moving the carboys in and out painless. Does what it says on the tin. Good for making it easier to carry an empty carboy. Don't rely on it for supporting a full carboy. These work great to lug around empty carboys and are well made. I've used these for years, and I haven't had one fail. I consider them an essential safety feature for glass carboys. I've recently moved to Better Bottle carboys, after a scary glass incident, and these work equally well with these. Frankly I was disappointed in this product because I actually felt like it was not as secure as I expected. I like having both hands on the carboy, so maybe this is just personal preference. Works great, makes carrying a snap. Only complaint is that if you use orange carboy caps, lifting by the handle will make the cap pop off. Not a big deal, really. I have a couple of these and they work great for lugging around my glass 6 gallon carboys. I haven't had any issues with them and I carry full carboys with one hand. Have one on a 6.5 gal carboy, when I was sanitizing prior to transfer, it almost slipped out of my wet hands full of sanitizer. Without this handle, I would've dropped it for sure. I have one on every carboy, it makes hauling empty carboys around much easier. I dont rely on the handle for full carboys though, I use a brewhauler for that! 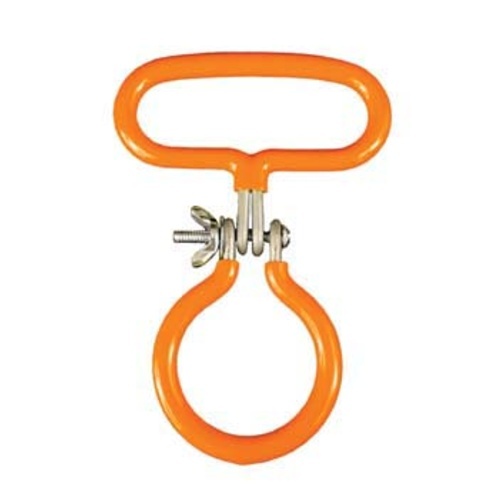 This simple yet very practical carboy handle is perfect for picking up and moving a (empty) carboy. If your carboy is full i too suggest a hand underneath for safety sake! The handle itself is strong and secures perfectly! These make moving the carboy a breeze and handing them no problem. Clamp tightly on the neck, just make sure to get the correct size. Always use two hands when lugging around the carboys. Makes it safer to use the all glass. Way easier to carry the bottle than craddling it. I like the sturdy feel. Makes moving carboys that much easier. Moving an empty carboy, you just use this but full you want to support with one hand on the bottom as well due to the weight and stress that would be applied to the neck if you just used the handle when full.